Welcome: PCC John Campion, West Mercia Deputy Chief Constable Amanda Blakeman, Chaic of the Fire Authority Roger Phillips and HWFRS Chief Fire Officer Nathan Travis. PLANS for firefighters for police to share the same headquarters have come to fruition after Hereford & Worcester Fire and Rescue Service (HWFRS) moved into West Mercia Police’s HQ at Hindlip Hall. The move aims to build on the already close relationship between the two organisations, improve efficiency and reduce overheads, creating a more effective public and emergency services for local communities. 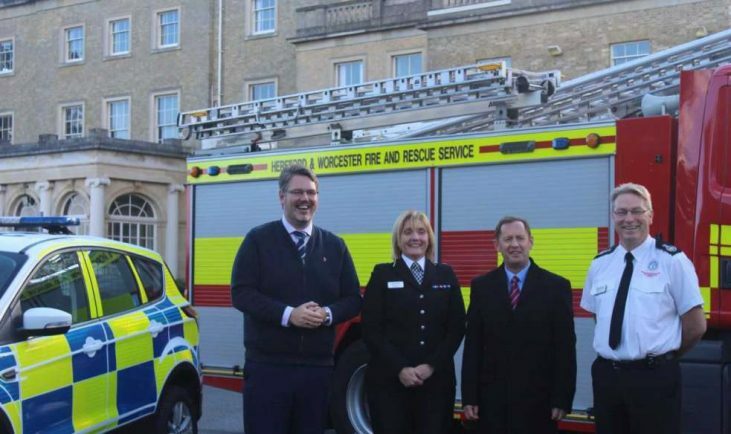 Police and Crime Commissioner John Campion, who has taken over control of the two fire services in the West Mercia area, said: “The two organisations already work hand in hand, with a shared ultimate aim of keeping people safe. “Whilst I welcome the efficiencies this will bring, the changes are about more than just buildings, it’s about growing skills, relationships, sharing experiences and working together to adopt a joint problem solving approach. Roger Phillips, chair of the Fire Authority said: “The re-location of the Fire Service to Hindlip Park is now complete, after four years of planning and departmental transfers. Amanda Blakeman, Deputy Chief Constable for West Mercia Police said: “We warmly welcome our Fire and Rescue colleagues to their new home. HWRFS’s ICT services have moved to Hindlip Hall together with HR, performance and information, finance and communications, as well as the senior management board, administration and committee services.